Classic American punk rock band whose love of British Motorcycles and Texas Blues clash onstage like Rockers & Mods, Brighton, 1964. 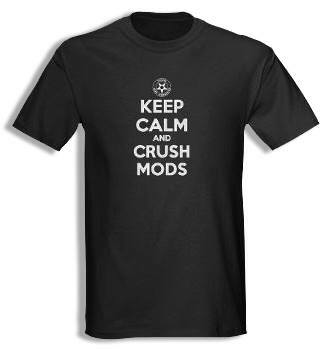 Get your very own “Keep Calm and Crush Mods” t-shirts here! We have limited sizes left, so get yours now! The shirts above are locally silk-screened, high quality cotton Gildan brand shirts. We also offer a wide variety of swag at Cafe Press, and we always have cool stuff for sale at shows, so come see us! Get the latest TMC news!